For some reason, pasta is not a dinner default for me. Because it’s generally a quick meal, pasta is inexpensive, and, most importantly, everyone in my family will eat it. (If you’re reading that and thinking I’m not that smart to be not making pasta more often, rest assured that I’m nodding my head along with you). Plus, pasta really makes excellent leftovers, which is a big deal to me because a day with leftovers for lunch is the easiest, quickest, most delicious kind of day. Time to repent of all my non-pasta-making ways. 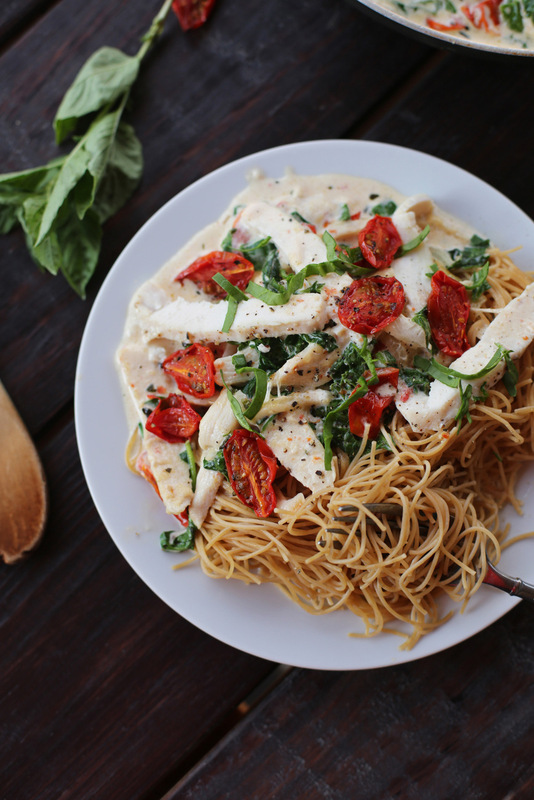 And this creamy Tuscan chicken pasta dish is KILLER. Fortunately there was more in the fridge, waiting to be eaten. And it was gone in a flash. 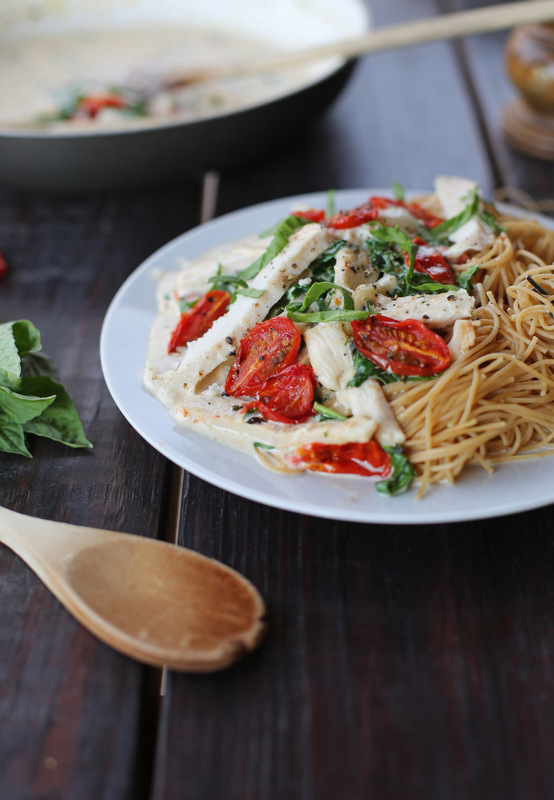 Also, the original Tuscan chicken recipe called for sun-dried tomatoes, but I couldn’t FIND sun-dried tomatoes at my grocery store that day (I eventually found them a few weeks later) and I only kind of like sun-dried tomatoes. I usually think they are overly chewy and I’m not wild about the flavor. But roasted tomatoes? I could eat the whole pan plain. They’re so easy and they’re BURSTING with flavor even if you start with semi unimpressive tomatoes. I had a bunch of grape tomatoes in my fridge that were starting to look a little soft and unappetizing and after a little round in a hot oven with some olive oil and salt and pepper, they were the most delicious things on the planet. Seriously, they make this whole chicken pasta dish that much more magical. And it was a pretty magical dish to begin with. Preheat the oven to 400 degrees. Line a baking sheet with tinfoil. Place the halved tomatoes and chicken breasts on the baking sheet, drizzle with the 3 Tablespoons of olive oil and generously salt and pepper everything. Bake for 20-30 minutes until the chicken is cooked through and the tomatoes are caramelized, with browned edges. While those cook, heat the 1 Tablespoon of olive oil in a large skillet over medium heat and cook the onions until very soft, about 10 minutes. 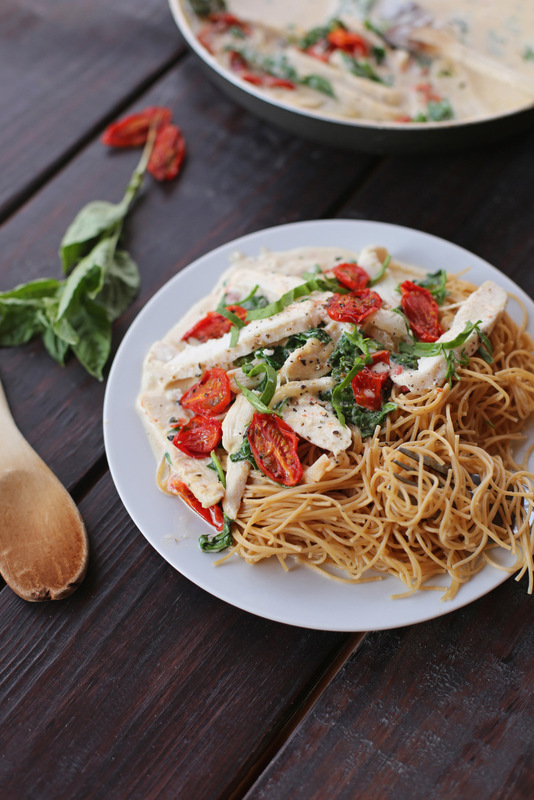 Bring a pot of water to a boil and add the pasta and let it cook until al dente while you make the sauce. Add the garlic to the onion pan, cook for about 30 seconds, then add the cream, chicken broth, Parmesan, and italian seasoning. Cook over medium-low heat, stirring frequently, until it is smooth and thickened. Slice up the chicken breasts. Add the chicken, the roasted tomatoes, and the spinach to the sauce and let cook 1-2 minutes until the spinach is slightly wilted. Salt and pepper to taste. 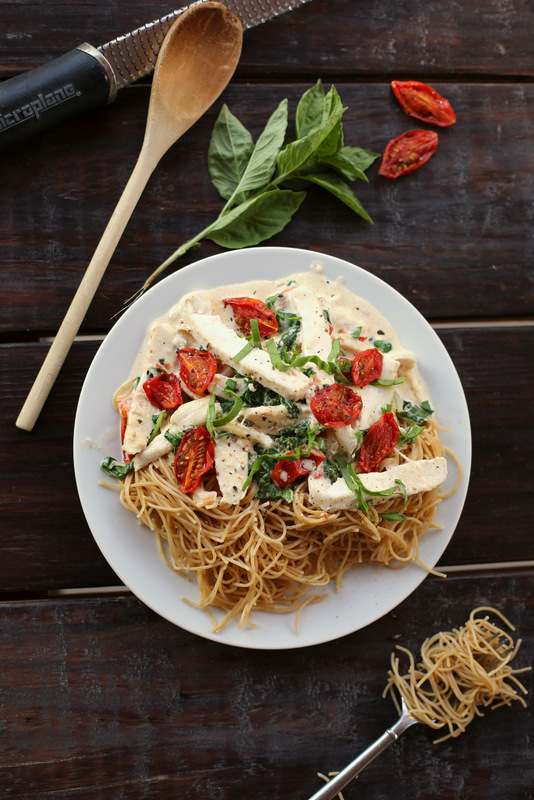 Serve the sauce over the pasta and top with the basil, if desired. I think I’m going to make this tonight! I have some grape tomatoes I need to use up. I am also not a fan of sun-dried tomatoes – the texture is off-putting to me. I hope you guys love it! And yes, the texture of sun-dried tomatoes is basically like tomato flavored leather to me. Bleck. I made this tonight – delicious! Thanks for the recipe. Oh man! It looks Devine. I don’t think I can do 2 cups of whipping cream though (I’d prefer to save it for a cake perhaps?) wondering if you’ve ever subbed something a little lighter in? A low fat cream cheese or maybe Gorgonzola?! Thanks for the recipe inspiration regardless! I never have, but if you try it let me know!